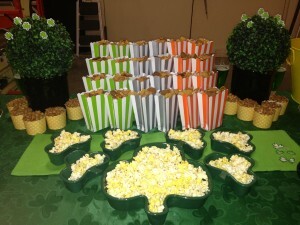 Plan a “Pot of Gold” Party this St. Patrick’s Day! St Patrick’s Day is one of the best nights to get together with friends and indulge in some cheerful fun so why not try your “Luck of the Irish” and throw a “Pot of Gold” Party this year! Use a green tablecloth to dress your table, maybe you have one from the holidays or I found a fun green linen with shamrocks on it at Homegoods for just $10 to cover my dining room table. I loved the idea of focusing on the “pot of gold” at the end of the rainbow as my theme. It’s a fun take on St. Patrick’s Day and in the spirit of re-using and repurposing items, I was able to use some yellow and gold accessories I already had and then just add some fun shamrock décor to complete the look. 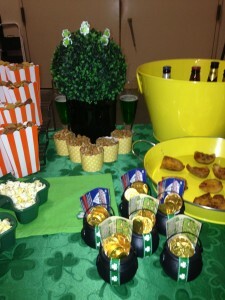 The pot of gold theme also had so many fun ways to give guests an opportunity to try their personal “luck of the Irish” by incorporating scratch-off lottery tickets in their own mini pots of gold and luck by chance for prizes by plucking a shamrock out of the topiaries to see who may have picked one of the lucky marked shamrocks to win! When I think St. Patrick’s Day, I think having drinks and laughs with friends in my favorite Pub so I themed the food around Pub Snacks and a twist on some Irish classics! 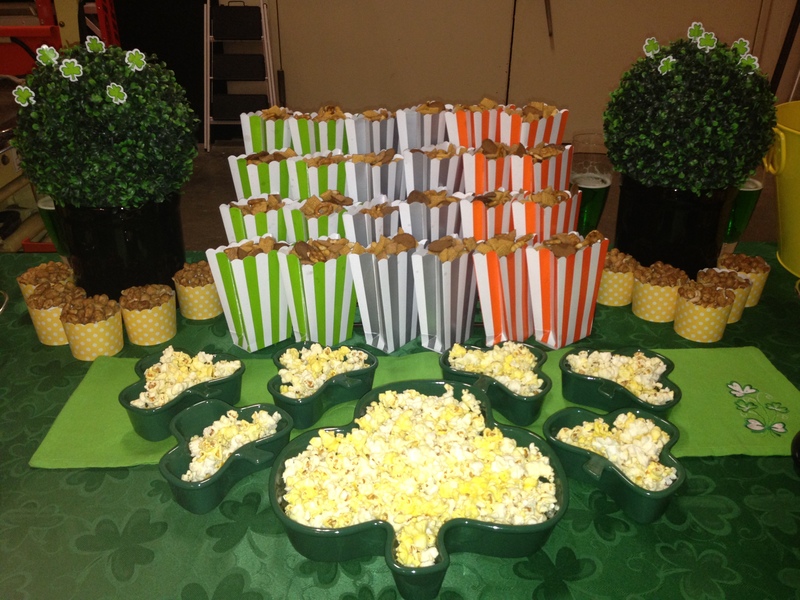 Pub Snack Mix – As the centerpiece of the table I purchased some mini-popcorn boxes at Party City (5) for $1 in the colors of the Irish Flag – Orange, White (they had white and silver boxes) and Green. I borrowed my tiered spice racks out of my cabinet and set the boxes up on the tiers to create a focal piece for the table and then filled them with what else but great Pub Snack Mix. You can make your own or in the interest of saving time, you can buy some pre-made Chex Mix at the grocery store. This way each guest gets their own individual box of Pub Snacks to go with their drinks. Pub Peanuts and Popcorn “Grab and Go” Mingle – I additionally added some cute yellow cupcake holders and filled them with honey roasted peanuts for another easy Pub grab for guests along with a shamrock shaped dish filled with popcorn and individual shamrock shaped dishes to fill with popcorn for guests to grab and go while mingling! Corned Beef Sliders on Potato Rolls with Shamrock Shaped Pickle Slices – For some more substantial food and to serve as a great carb foundation for those indulging in a few glasses of Irish cheer, I made some corned beef sliders on potato rolls with shamrock shaped pickle slices. If you want to make your own corned beef, I say Slainte! But if you need a time-saver, you can simply go to the deli and order a pound or two of sliced corned beef deli meat to make your sandwiches. I found perfect sized potato rolls for individual bite-size sandwiches and then I purchased a jar of whole pickles to make my shamrock shaped pickle slices. Simply cut a section out of the full pickle lengthwise along three sections and then slice and you’ll have some adorable and easy shamrock shaped pickle slices to add to your sandwiches. Add some mustard and your guests will have a delicious, filling and easy sandwich to enjoy while they indulge. Potato Skin Wedges – Playing off of the classic Irish dish containing meat and potatoes, I thought another easy and fun grab and go Pub appetizer would be potato skin wedges. Again, you can make your own baked potatoes, hollow them out and add some cheese and bacon bits or if in the interest of time you need to buy and heat that’s fine too… Parties are about having fun with people you love not always about being perfect so whatever works best for you and allows you to enjoy the night with people you adore – do that! Shamrock Shaped Cupcakes – Something Sweet is always a welcome treat on any party table. This I loved because in a few easy steps you can make your own shamrock shaped cupcakes with just your round tin and some tinfoil – no special tools required! 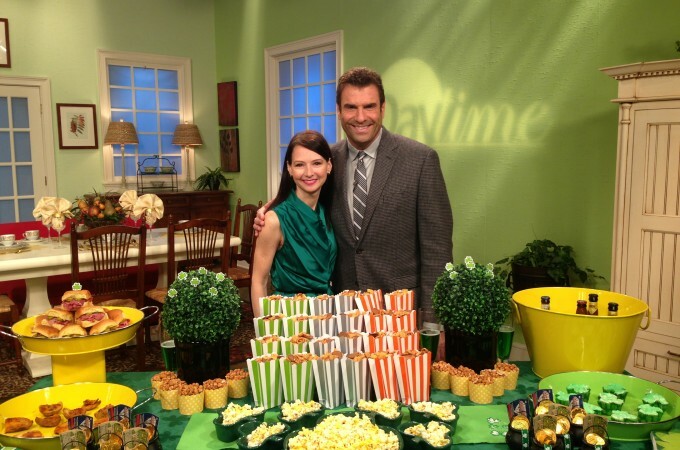 Use some white cake mix and add a drop of green food coloring to the batter to get your green shamrock look. Place the cupcake holder in the pan and then roll up pieces of tinfoil and insert them between the paper of the cupcake holder and the wall of the tin in three even parts so when the cupcakes cook they won’t expand in those sections and will end up baking in the shape of a cupcake! Frost with green frosting by adding some food coloring or you can use a food coloring spray to tint white frosting green as well. Guests will love it and it’s an easy project you can have kids help with as well. George Killian’s Irish Red – A ruby-colored ale with toasted caramel malt flavor. Magners Irish Cider for guests who like a sweeter drink versus a heavier beer. In Ireland Magners is called Bulmers but because of a name conflict in the United States it is called Magners here but has the same crisp and delicious taste as what you would have in the Pub in Ireland. Green Beer – You can use one drop of green food coloring in a lighter-colored beer to festively turn it green. It won’t change the taste, only the color and your guests will love it! 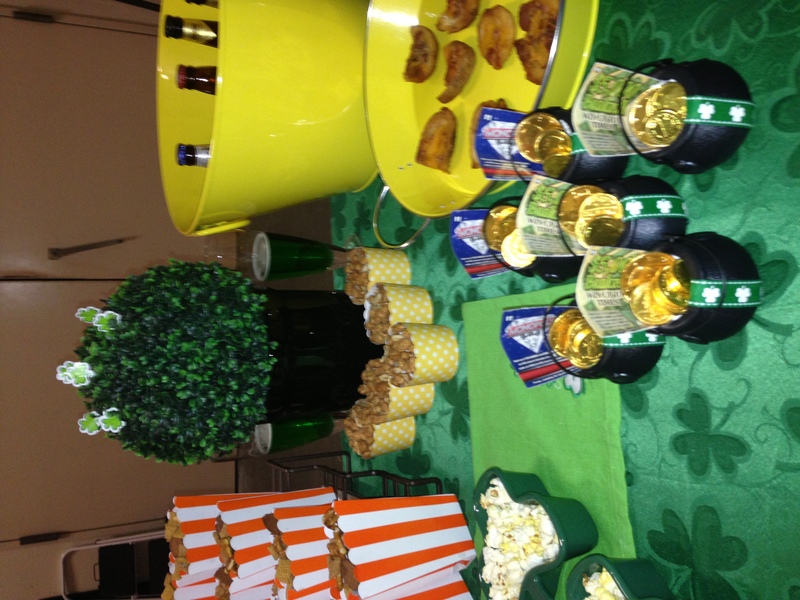 Individual Pots of Gold – I also found individual pots of gold favors at Party City (12) for $3 and then purchased $1 scratch off lottery tickets to go in each one as well as chocolate gold coins so guests can take a chance at picking their pot of gold and see if they have the “Luck of the Irish” for a fun win! Plus they make an adorable addition to your table. “Shamrock Shrubs” – I added some small topiaries to the table for décor and then added shamrock cupcake picks to the shrub with several of the pick bottoms colored to denote winners. Guests can again test their “Luck of the Irish” and pluck a shamrock out of the shrub to see if they may have picked a “lucky shamrock”. I purchased a few quick-pick Powerball tickets for those winners as gifts. St. Patrick’s Day is notorious for letting loose, indulging and having a great time with friends and family – Let’s all just keep in mind we don’t want to chance luck in safety so enjoy but definitely select your “lucky” designated driver before you go out to make sure you all get home safe!